Gwenview is an image viewer for KDE. 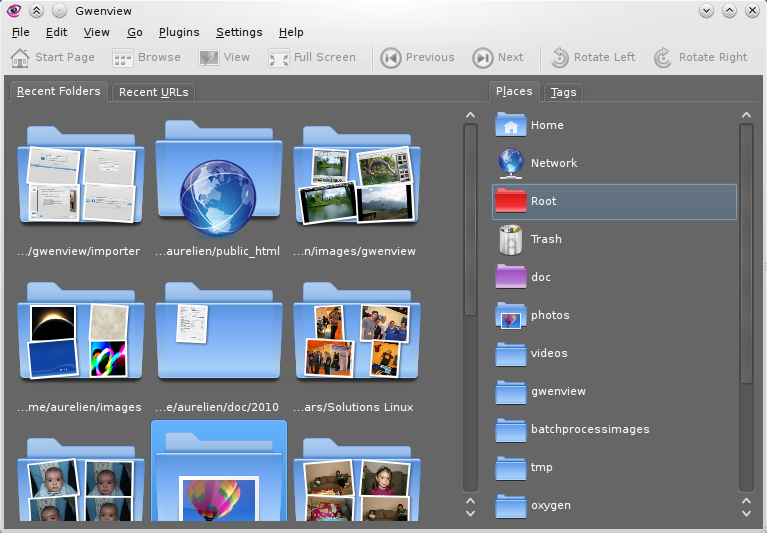 Gwenview can load and save all image formats supported by KDE. It correctly displays images with alpha channel, using the traditionnal checker board as a background to reveal transparency. Gwenview let you accurately control the way images are scaled: you can zoom in and out or automatically scale the image to fit the window. Zoom is locked so that you can easily compare images by going back and forth. When browsing JPEG images with EXIF information, Gwenview automatically rotates them according to the EXIF Orientation tag. It can show image properties and image specific meta-information like Dolphin does. It knows about animated images like MNG or GIF and is also capable of displaying vector images in SVG format as well as playing videos. Gwenview does not try to replace your favorite image editor, so it only features simple image manipulations: rotation, mirroring, cropping, resizing and red eye reduction. When working with JPEG files, Gwenview performs lossless manipulations. Gwenview features the necessary file management operations: copy, move, delete, rename and drag'n drop images. It has full support for KIO slaves: you can browse FTP/Windows shares, go into tar balls or zip files. The fullscreen with optional thumbnail bar and the simple built-in slide show allows you to present images the way you want them to show. Gwenview features a browse mode to get a quick overview of images in a folder and a view mode to go through one image at a time. The view mode can also display a thumbnail bar. Visit the screenshot section to see what it looks like. Gwenview can be used both as a standalone application and embedded in other KDE applications through the KPart system. For example, thanks to Gwenview image KPart, Konqueror can display images using Gwneview, letting you zoom in and out as well as rotate it. If you need more information please contact the developers of Gwenview (KDE e.V), or check out their product website.